Today, 28 January, on the Novus Ordo calendar, is the liturgical memorial of Saint Thomas of Aquino, priest of the Order of Preachers and Doctor of the Church. The young Thomas was educated as a Benedictine Oblate by the monks at the venerable abbey at Monte Cassino. Despite his family’s opposition, he joined the newly founded Dominicans and studied under St Albert the Great. He is known to have been gifted by God with significant gifts of intellect. Aquinas was known as the Doctor Communis and the Doctor Angelicus. The Doctor Communis is recalled by many for his Summa Theologiae. This work is prefaced as an “instruction for beginners,” written not for the smartest of the students at Paris, but for the average Dominican friar. I am trying to imagine what a work for the smartest would look like. 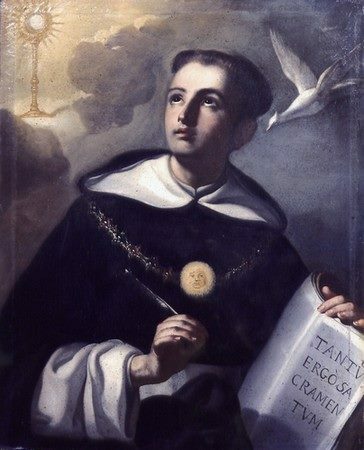 Among his other accomplishments he was invited by Blessed Pope Gregory X to participate in the Second Ecumenical Council of Lyon; Aquinas died on 7 March 1274 while making the journey in the Cistercian Abbey Fossanova in Lazio, while giving a commentary on the Song of Songs. On this day his body was translated to Toulouse. You may be interested in reading GK Chesterton’s 1932 essay, “St. Thomas Aquinas,” in The Spectator, which led to his book on the friar saint.